1977’s The Mercenary is a fix-up. It comprises three Jerry Pournelle stories: Peace with Honor (1971), The Mercenary (1972), and Sword and Scepter (1973). These are among the earliest of Pournelle’s stories1. 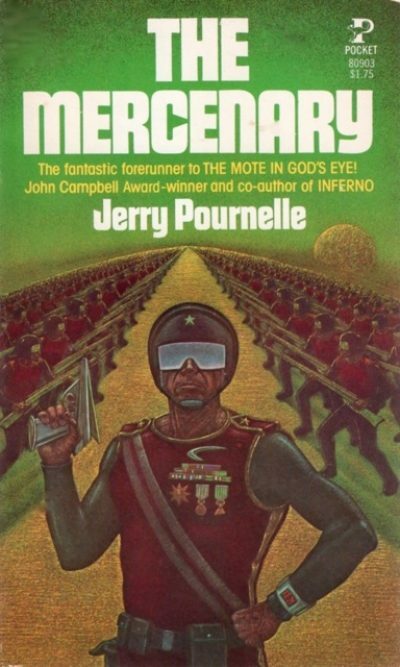 They must have impressed readers because The Mercenary was nominated for Best Novella (losing to Le Guin’s The Word for World is Forest ) while Pournelle himself won the very first John W. Campbell Award for Best New Writer. The Second Cold War ended with the formation of the CoDominium in the 1990s. The Soviet and American forces dominate the Earth. Thanks to the timely development of the Alderson Drive, those who object too loudly or who are simply surplus to needs can be shipped out to the interstellar colonies. It’s not a just system but it works. Or rather, it worked. Now nationalists across the planet want to bring it down and with it, civilization on Earth. America’s Welfare State gave the US what amounts to a formal caste system—but it’s still a democracy and Americans still get to chose their government. At least to a degree. As long as the voters vote responsibly. Demagogue Hanson’s Patriot Party and idealist Bertram’s Freedom Party’s rise in the polls threatens the Unity Party’s hold on America … and also world peace. Only the Unity Party is willing to make the compromises necessary to keep the CoDominium functioning. If the voters are not responsible enough to see this, then it is the duty of men like the Honorable John Rogers Grant to take whatever steps are necessary to save the electorate from itself. The title of this story seems to be a dig at Nixon. I think. Woodrow Wilson also used the phrase. The story is filled with odd little details I was not sure were significant, like the use of the spelling “Rumania” (which simply seems to be artifact of the fact this was written before “Romania” became the default spelling) or the choice of Bakersfield for the site of a terrorist nuclear attack. Poor Powers and poor Unity Party: hopelessly corrupt, unhappily aware of their corruption, but unable to walk away from power because the opposition constitutes an existential threat to Earth. Not that it matters too much what happens in the US, because the Soviets have their own flag-waving lunatics and it only takes one side to start a war. Cashiered after a court martial, John Christian Falkenberg has turned from enforcing the peace for the CoDominium to undermining it as commander of a mercenary company. Just one of the many mercenary companies exploiting the chaos as the CD withdraws from marginal worlds across inhabited space. Hadley was a pleasant enough world until the Bureau of Relocation dumped a half-million shiftless Welfare transportees on the planet. If the transportees were willing to work, Hadley might weather the coming crisis that will inevitably follow independence. But the products of the Welfare State (shudder) believe that it is their right to be supported in drugged out indolence, just as they were on Earth. Alas, they have the numbers to sway the next election. Some of Falkenberg’s paymasters on Hadley are idealists. Others merely want personal power. None of them have the clarity of vision or resolve to do what must be done to save the planet. But Falkenberg does. Is there no problem that cannot be solved with mass executions in stadiums? Thank goodness there are so many stadiums available. Note that while the libertarian engineer-politician Hanson is a sympathetic character, his idealistic vision of a world without government would result in even more deaths than Falkenberg’s stadium massacres. Think planet-wide Somalia. Hadley is a nice example of the so-called “Dutch Disease” : because their mines provided a nice, steady income, the settlers—the good decent ones, not those Welfare bums—never bothered to industrialize. Instead, they imported goods from off-world. Great idea, until the mines played out. Falkenberg’s misfortune is New Washington’s luck: only a down-on-his-luck mercenary would accept an unpromising assignment like helping the freedom fighters on New Washington throw off the shackles of twin-planet Franklin. Luckily for the rebels, Falkenberg is very, very good at his job. Less luckily for the rebels, Falkenberg may be taking their money but he is not working for them. Edward Sokya did a lot of Pocket’s covers in this era. I am neither repelled nor pleased by his art; it just is. Nonetheless, many of his covers evoke a pleasant nostalgia. This cover is an exception. I am reminded of bad Poser art. I don’t know much about Sokya; his heyday seems to have been the 1970s. I hope whatever led his career as a cover artist to dwindle away was the distraction of something better. 1990	Series of treaties between US and Soviet Union creates the CoDominium. Military research and development outlawed. 2004	Alderson Drive perfected at CalTech. 2008	First Alderson Drive exploratory ships leave the Solar System. 2010	Inhabitable planets discovered. Commercial exploitation begins. 2020	First interstellar colonies are founded. Great Exodus period of colonization begins. Not only do they manage to go from concept to working models in just four years despite living in a regime that frowns on innovation, but there’s another astounding development not mentioned in the timeline: cheap fusion rockets. Cheap crewed fusion rockets. Why? Because Alderson Points (the only places where turning on the Drive results in instant transportation to another stellar system) are not conveniently located in the inner system but farther out, where chemical rockets would take years or more to reach them. We’re talking extremely cheap transportation as well: the CD carries out a program of forced migration on a scale the Czars would envy. 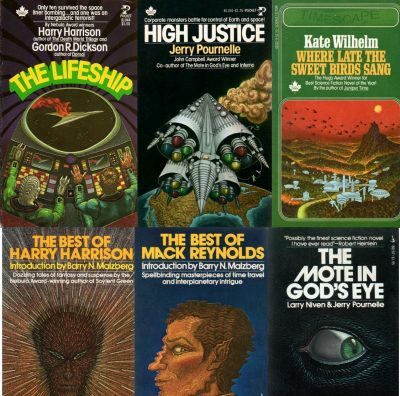 The vision of welfare recipients as endlessly breeding, drug-addicted layabouts fit only for relocation or mass graves is, of course, just part of Pournelle’s delightfully effervescent world-view, one that got him significant recognition back in the early 1970s. He didn’t just win the inaugural Campbell: he beat George Alec Effinger , Ruth Berman , George R. R. Martin , Robert Thurston , and Lisa Tuttle to do it. While Pournelle seems inspired in part by earlier SF, Falkenberg owes a lot to Poul Anderson’s Dominic Flandry ; both serve corrupt states to forestall something much worse. Although there were earlier SF stories about military men, I am inclined to see The Mercenary as the first true MilSF novel3. Earlier novels had some of the elements I expect when I crack open a new MilSF but few had all of them. This on the other hand delivers exactly what I expect, from troglodytic politics to technological developments artfully designed to preserve the human element on battlefields, from post-Vietnam American Dolchstoßlegende to the glorification of mass murder. This is no coincidence. 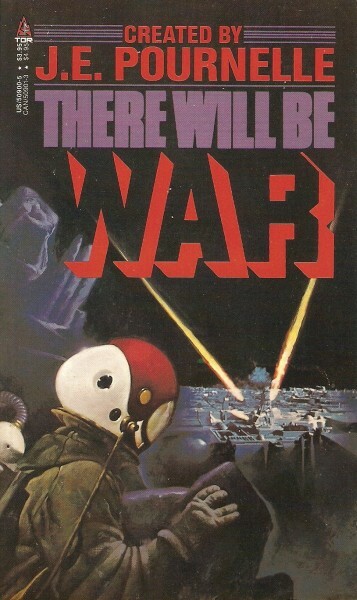 Pournelle more than any other single person shaped MilSF into its modern form with his There Will Be War anthologies. Baen and other publishers (note who published the first There Will Be War) might have been willing to print MilSF once it accreted into a coherent sub-genre but it was Pournelle in his role as editor who provided the seeds around which it accreted 4. If someone were considering an award for MilSF—a real award, not some half-assed joke with email voting seemingly designed for freeping—they could do worse than to name it after Pournelle. The various components of The Mercenary were cannibalized into other works. Given how huge print runs were back in the Disco Era, I am sure used copies are available. PS: Title inspired by the remarkable Janet Greene’s classic The Hunter and Bear. 1: Although they were Pournelle’s second, fourth, and sixth published stories, readers in Nixonian American would have thought they were Pournelle’s first three stories because the others were written under the Wade Curtis pen-name. 2: Having wasted more time than I want to admit looking for an online version, I must admit defeat. There is an online version but it is from an ill-conceived 1990s attempt to preserve the setting past its sell-by date. 3: Starship Troopers fans can try to make a case in comments. You poor deluded fools. 4: Pournelle, who if I recall correctly is a veteran of the Korean conflict, does mention logistical details more often than I expect in MilSF. Not the fun kind of logistics, involving the production of a million zillion Squamoid Hypermissiles, but the mundane sort, like who gets to dig the latrines. Latrines are not romantic, but nobody wants a battle called off because the men all have dysentery and are too busy shitting blood to fight.